Above: A map of the projects. Blue and purple indicate new construction. Minneapolis is poised to commit more than $8.8 million this year from it's affordable housing fund to build and preserve low-income housing throughout the city. A city panel gave initial approval Tuesday to funding eleven projects, which are scattered near downtown, south Minneapolis and Near North. The money -- a mix of city and federal funds that the city allocates annually -- will help construct 371 new housing units and rehab another 543. "We are seeing in the city, more so than I've ever seen before, private buildings moving to market-rate," said council member Lisa Goodman, who chairs the community development committee, explaining the need for the rehabilitation of existing affordable units. "It's just more beneficial for developers -- even if they are non-profits -- to turn around and sell out early and then move those units into market rate," Goodman said. "We don't want to see that happen." The largest award, $1,861,000, will aid the rehab of 200 housing units at Ebenezer Park Apartments, a 1980 high-rise on Park Avenue that provides low-income senior housing. Above: A rendering of Great River Landing, a proposed 72-unit affordable housing project near 5th Street North and 8th Avenue in the North Loop (via Beacon Interfaith Collaborative). - Longfellow Field Senior Apartments, an entirely affordable 62-unit apartment building proposed near the Midtown Greenway and the Lake Street Hiawatha LRT station. 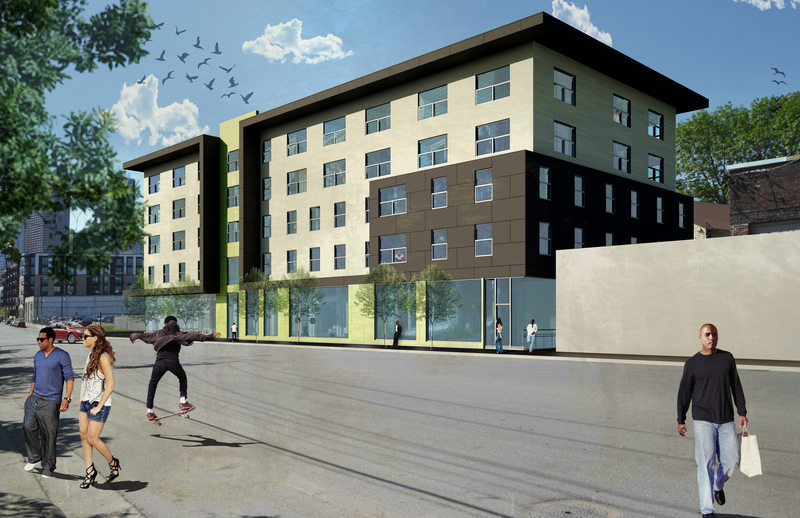 - House of Charity Housing, an entirely affordable 65-unit project in the Elliot Park area. The site is currently occupied by the House of Charity Food Center, which offers food and housing to the homeless. - West Broadway Curve West, a mixed-income 63-unit building proposed at 1920 West Broadway, beside an accompanying project that was recent erected. - Indian Neighborhood Club Expansion, an entirely affordable 20-unit apartment project in the Ventura Village area. - Anishinabe Bii Gii Wiin, a 32-unit new building beside an existing facility for homeless people with disabilities -- which will also be rehabbed. The new building will be a sober housing facility.